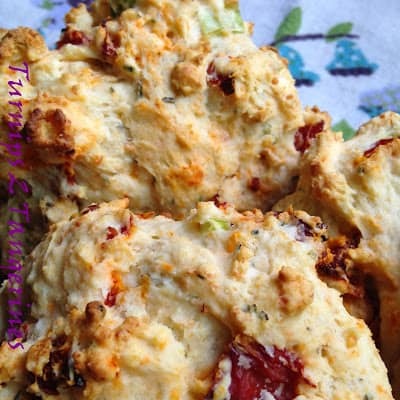 Sun-Dried Tomato Scones are delicious served with steamy bowls of soup, stew or chili. 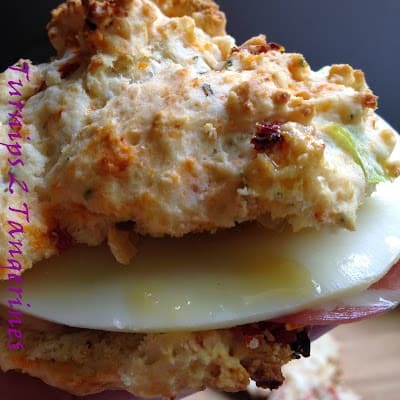 Sun-dried tomato scones can also be used to make a delicious sandwich. 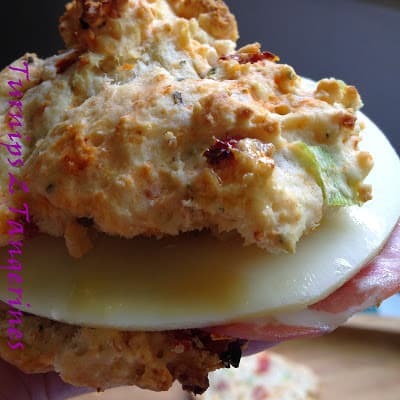 More specifically, a capicola and provolone sandwich but more on that later in this post. 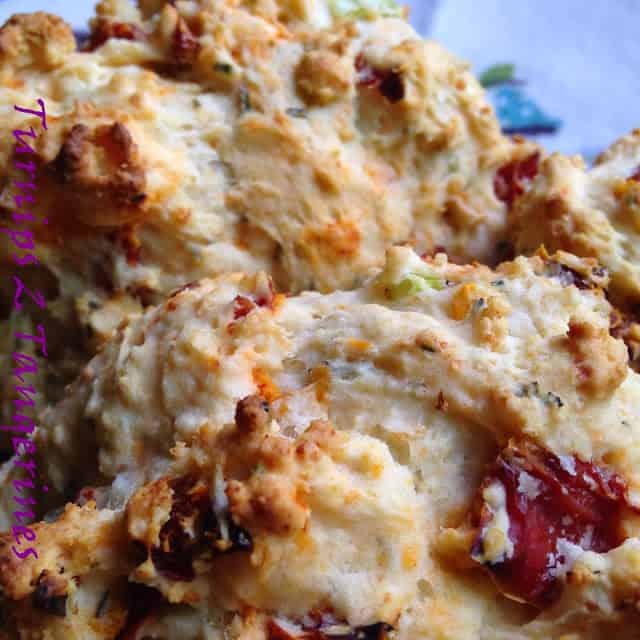 Sun-dried tomato scones are made extra easy by using a buttermilk baking mix such as Bisquick. 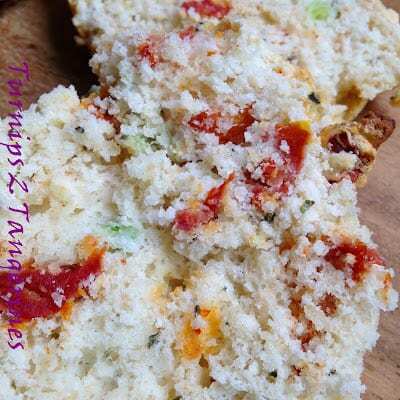 Parmesan cheese, spices and diced sun-dried tomatoes are added and the end results are delicious. Coppa is a traditional Italian cold cut. It is dry, cured, and sliced very thin. 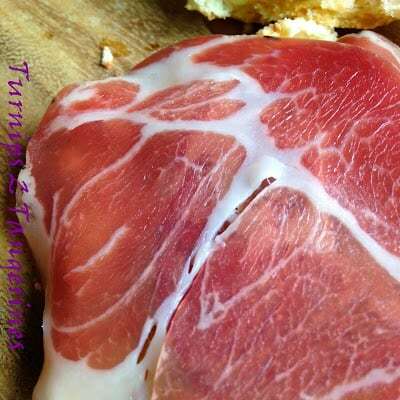 It is similar to the well known cured ham, prosciutto. Capicola is lightly seasoned with red and/or white wine, garlic and a variety of herbs and spices. It is often rubbed with hot paprika or cracked black pepper. Capicola is somewhat on the spicy side with a nice salty bite. 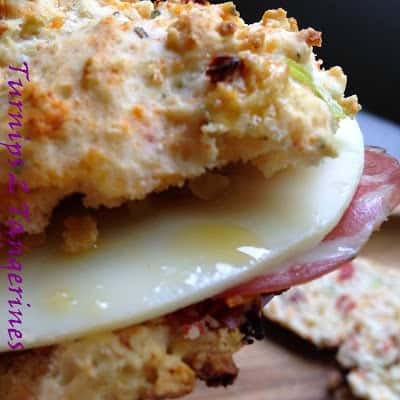 Capicola adds great taste to sun-dried tomato mini sandwiches or any sandwich. Giardiniera is the must have condiment for an Italian Beef Sandwich and in Italian the word means “from the garden” but how in the world do you pronounce it? JAR-DIH-NAIR-AH. After saying it about 3 times in a row, it starts to sound right! Many recipes differ, but Giardiniera traditionally contains hot or mild peppers, celery, carrots, pitted green olives plus other vegetables mixed with a spice blend and packed in olive oil. 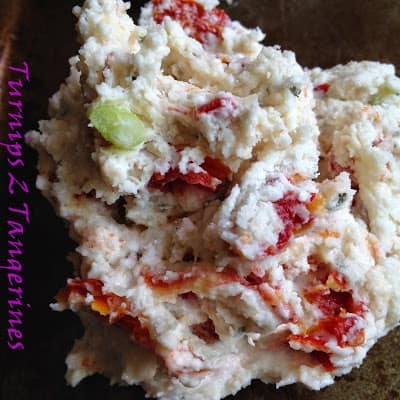 Sun-dried tomatoes are a favorite here on Turnips 2 Tangerines. We have several recipes you might want to try calling for this “secret” ingredient. Sun-dried tomatoes add sweet tomato flavor to anything they’re added too. Sun-dried tomatoes are concentrated with flavor and vitamin C. They are available year’round which makes them the perfect ingredient during the long winter months. Chicken Thighs in Creamy Sun-Dried Tomato Sauce. Preheat oven to 450º F. Lightly coat a baking sheet with nonstick cooking spray; set aside. Combine baking mix, cheese and basil in medium bowl. Stir in milk, tomatoes and onions. Mix just until dry ingredients are moistened. Drop dough by heaping tablespoonfuls onto prepared baking sheet. Bake 8 to 10 minutes or until light brown. Remove baking sheet to wire rack; let stand 5 minutes. 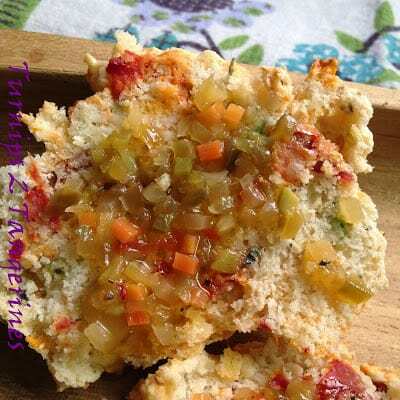 Remove scones and serve warm or at room temperature. 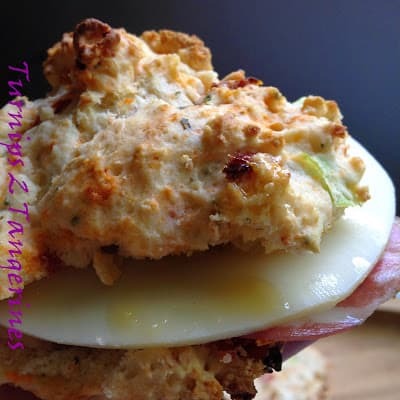 Slice scones in half. 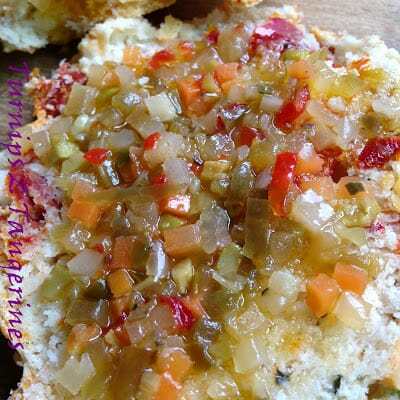 Spread halves with giardiniera relish. Layer slices of capicola ham cheese on one half, on with remaining half. Wrap in foil. Bake at 375º for 10 minutes or until cheese is melted. 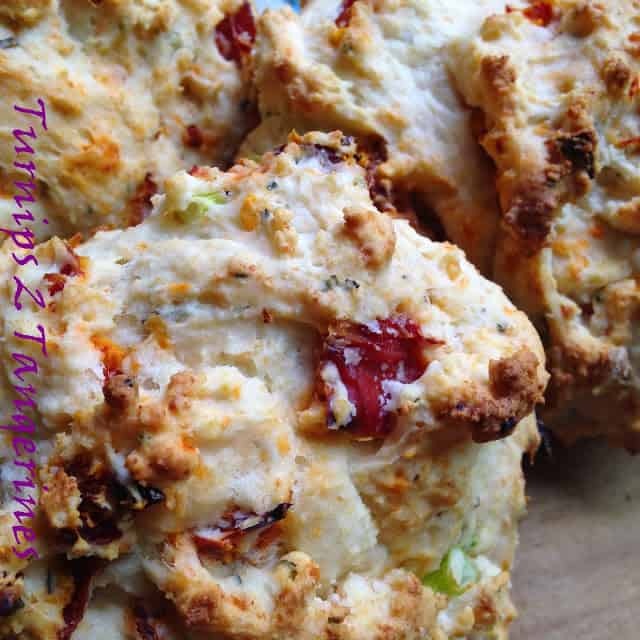 Your Sun Dried Tomato Scone look fantastic, we will really enjoy them! Thanks so much for sharing with Full Plate Thursday and have a great weekend!